Saint Albans City Hall is located at 100 North Main Street, St. Albans, VT 05478; phone: 802-524-1500. Photo: Houghton House, ca. 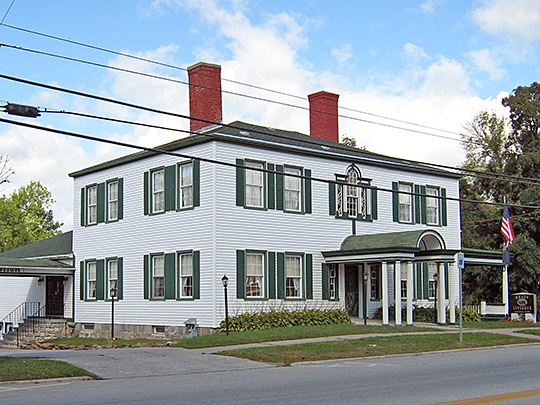 1800, 86 South Main Street, St. Albans, VT Listed on the National Register of Historic Places in 1972. Photographed by User:Mfwills (own work), 2009, [cc-by-3.0 (creativecommons.org/licenses/by/3.0)], via Wikimedia Commons, accessed December, 2012. St. Albans, the shire town of Franklin County, is rightly known as The Railroad City. Containing the office headquarters, yards, and shops of the Central Vermont Railway (now a subsidiary of the Canadian National), it owes much of its vigorous growth to its excellent transportation facilities and its steady prosperity to the employment of large numbers of its residents by the railroad. The establishment of direct connection by rail with the outside world through the Central Vermont Railway was the turning-point in the industrial history of St. Albans, which had almost no importance as a shipping point during the heyday of water commerce on Lake Champlain. Construction of the road was begun in 1848 at Essex Junction, but was suspended when about half completed because of lack of funds. President Smith and others seeking to incorporate borrowed the needed money on their personal credit and saved the project from failure. The first train entered St. Albans on October 18, 1850, a diminutive wood-burning locomotive named 'Abigail Adams' having pulled it all the way from Montpelier. Works Progress Administration, Federal Writers' Project, Vermont: A Guide to the Green Mountain State, American Guide Series, Vermont State Planning Board, 1937.